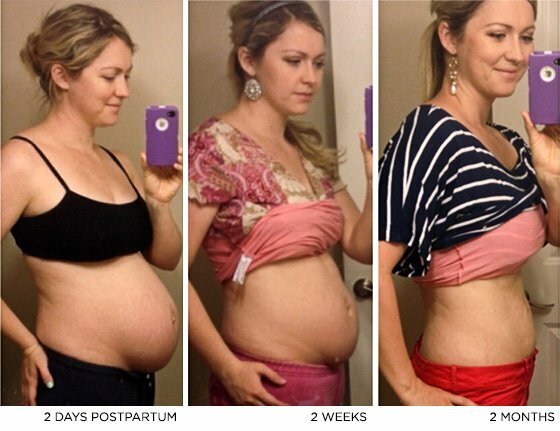 It's a few weeks after delivery, and you're itching to get back your pre-baby body. Here's your post-pregnancy fitness plan. Your body is amazing. For nine months you focused all of your energy on creating another human being, and you finally accomplished it. Congratulations! But even if you were active during your first trimester, you've likely gained some unwanted weight or lost pre-pregnancy definition. When it comes to regaining your figure, working out is essential. But knowing when to work out, what to expect, and how to steer clear of temptation is even more important. Luckily, I've been through it twice. Here are eight helpful the rules I picked up along the way! My midwife didn't give me clearance to work out until six weeks postpartum. That's a standard recommendation, which maybe even longer if you had a c-section. Follow it. Working out too soon can actually make your recovery period last longer; cause long-term damage to your stomach muscles; and, if you are breastfeeding, affect your milk supply. If you're struggling to find the time to work out right after your baby's born, focus on your nutrition. After my first son was born, I was tired, sore, and emotional—and I had a fussy baby who wouldn't let me put him down for long. Cooking was out of the question. I resorted to the easy, unhealthy route: think lots of pizza delivery and cold cereal. If you aren't focusing on the food you're fueling your body with, you're probably going to have a tough time shedding the weight and toning up. 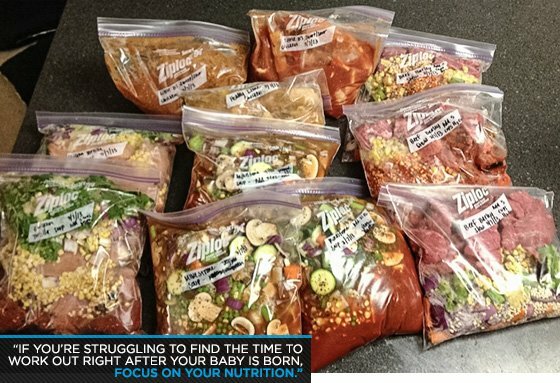 The second time around, I decided to come prepared and freeze healthy meals that I could pop in the crock pot once the baby arrived. Chicken tortilla, beef and barley, and minestrone soup were all on the menu, along with honey lime and sweet and sour chicken. 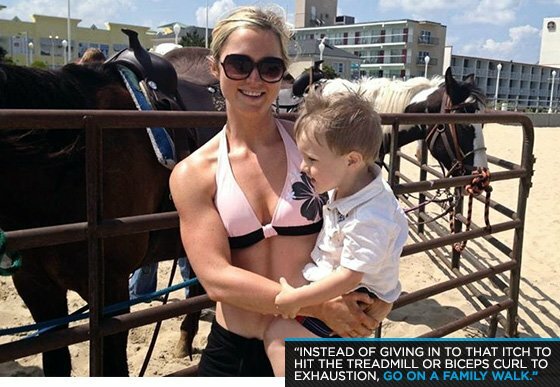 I also prepped double batches of Jamie Eason's protein bars, which were a lifesaver after the baby came. My doctor told me that one serving of protein powder per day was perfectly fine to use while nursing, as long as it wasn't my only source of protein for the day. Try to use protein powders that don't include artificial sweeteners or fillers. My favorite kind of protein is MRM All Natural Whey Rich Vanilla flavor—it's what I used while I was pregnant and now that I am breastfeeding. If you have questions, always check with your doctor. While it might seem like a no-brainer, giving up junk food can be a struggle, especially for a new mom. Exhaustion will likely weaken your willpower, and the meals people bring as gifts might not be the healthiest option. Still, you'll be grateful, and you'll eat them. Counter the platters of lasagna, chicken fingers, and baked mac and cheese by stocking up on fresh fruit and lean protein. Prepare easy-to-grab snacks like homemade protein bars and pre-packed sliced veggies. Bag the bottle. Not only will breastfeeding ensure you're passing on whole-food nutrients to your baby, it will also help you shed the baby weight. You can burn up to 500 calories per day just by breastfeeding! It also helps your uterus contract, which will help make your stomach flatten faster during those first two weeks. Breastfeeding can be difficult at first. I struggled nursing my daughter in the first two weeks. Try reading up on breastfeeding before the baby is born—Ina May's Guide to Breastfeeding was the most helpful book I found—and prepare to work with a lactation consultant after the baby comes. Don't count on consistency. Once you get clearance to exercise, it's unlikely that you'll still have a full hour to dedicate to the Stairmaster. It might be hard to get into a regular schedule during the first couple of months when the baby's still not sleeping through the night, and most gym daycare facilities won't take babies until they're at least 6 months old. So squeeze in a trip to the gym whenever you can, and get creative with at-home workouts. I've gotten some serious results using Ashley Conrad's Celebrity Abs routine. Still strapped for time? Remember, even a short post-dinner family walk while pushing the stroller or strapping on the baby carrier is better than doing nothing at all. I really struggled with this one after I first got back in the gym. The extra weight left me feeling frustrated, and I was embarrassed that I couldn't lift heavy. I felt like I didn't belong in the weight room around all the fit people. I pushed through it by reminding myself that I'd felt this way after my first son was born, and that nothing was going to change until I started putting in the work. You can feel uncomfortable now or three months from now, but you're always going to have a starting point. The sooner you start, the sooner you'll stop feeling self-conscious. 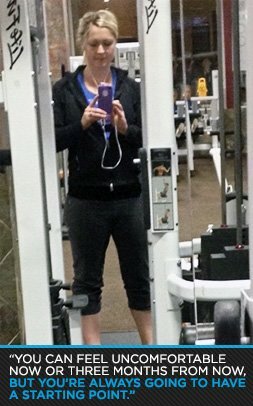 I try to remind myself that I feel better when I work out. It builds my confidence, makes me happier, and usually leads me to make smarter nutritional choices. Your workouts might not start out as intense as they were pre-pregnancy, but you'll eventually get back to that point and should be proud of your progress along the way. Getting back in shape takes time, and simply removing the baby that was inside you isn't enough to get back your tight tummy. After I had my first son, I was surprised that I came home and still looked six months pregnant. I remember feeling so bad about the extra weight. While I eventually shed the pounds and regained my shape, it didn't happen overnight. It took months. If I had known that most women still look pregnant after they have a baby, my self-talk would have been a little more loving. Clean eating and exercise will get you back in shape, but give yourself a realistic time frame. Now I know not to expect to feel totally back to normal for 9-12 months—the time it takes for me to lose the weight, for my hips to go back down, and to rebuild the muscle I had pre-pregnancy. On my website and Facebook page I've been sharing my post-partum photos during this process to hopefully try to normalize the images we see of a woman's normal post-partum belly and hopefully make other people feel comfortable during the process as well.